Ernesto Valverde seemed to have finally taken the right approach against newly promoted side Huesca who took the lead early on, within 3 minutes of the game. A previously seen attitude of determination was visible in the team that had lost some grip last season after the devastating losses at Roma and then to Levante, ending their unbeaten run. The manager was criticised heavily after the game against Valladolid after he subbed on Arturo Vidal, a more defensive player for Ousmane Dembele, who scored the only goal of that game. This tactical tweak had slowed the Blaugrana’s attacking prowess in that final third post this substitution, which infuriated the cules as the move was considered rather cowardly. The Spanish manager finally had 23 players in his squad, the exact number he wanted after Paco Alcacer was sent on loan to Dortmund for a year. 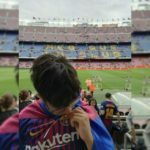 Huesca were coming to the Camp Nou after playing a draw at San Mames, scoring a late equalizer, which could turn out to be the goal of the season. They started off their campaign playing Eibar away, with their wide midfielder Alex Gallar scoring two, before halftime, one from a sumptuous freekick. Eibar scored a consolation goal and could only do so little. It was perfect start to the campaign by the newly promoted team from Aragon. This would to soon change, though. Barcelona lined up in an unchanged 4-3-3 system after their narrow 0-1 triumph at the Estadio Jose Zorrilla. Huesca had done their homework and knew Valverde’s side would be vulnerable to crosses from either side of the pitch and started attacking early on, scoring with their very first attack of the game. Right-Back Jorge Miramon put in a perfect cross for striker Samuele Longo who headed it in the way of his partner Cucho Hernandez. The latter showed his lethal poaching instincts as he stuck out his leg, putting the ball out of reach for goalkeeper Ter Stegen. The Camp Nou is fortress and a team of the ilk of Barcelona bite back like a wounded lion once they are under the cosh. That is exactly what happened when Lionel Messi showed incredible individual brilliance and beat 2 players with one turn of the ball and then finished the move by putting the ball in the bottom right corner far from the reach of goalkeeper Axel Werner. Barcelona’s No.4 then decided to go for the spectacular, striking the ball from 25 yards, only to be denied by the goalkeeper. We’ve seen Ivan Rakitic hit those before, most of them during his stint at Sevilla. Messi and Suarez combined yet again to create a goalscoring opportunity, with the Argentinian heading the ball right in the hands of the goalkeeper. After being denied two goals in successive attacks, Huesca saw their lead disappear after Alba’s cutback to Messi was intercepted by defender Jorge Pulido. Unfortunately for him, the ball crawled in the goal after his touch. Barcelona benefitted from quite a few own goals last season, as they saw opposition players turning the ball in time and time again. It was after this attack that we saw the new, smart investment of the Video Assistant referee come into action to check if the ball had crossed the line out of the pitch before Alba could play it in. Dembele, heralded as the true heir to Messi’s throne showed so why, after his curling effort nearly crept in the far corner of the net, hitting the crossbar. 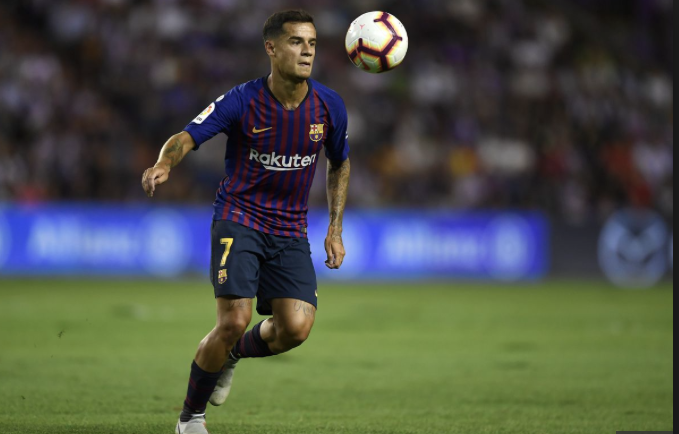 Huesca were caught sleeping after Coutinho played in a pass for Alba who in turn played it in the box for Suarez. He finished it with a simple touch and opened his goalscoring account for the season. Alba’s ever so present pillage for attacks was seen here, as he was being checked for offside, only to be saved by a yard or less. Barcelona’s lead was cut in half just before halftime, as Huesca targetted their opposition’s weak spot once again. Umtiti and Pique were seen ball watching as Moi Gomez improvised off a failed cross to assist Alex Gallar, who scored his 3rd of the campaign. 5 goals in the first half saw Camp Nou at their feet at all times, and their beloved Barça had so much more in store for them in the next 45. No changes were made during the break by either team, as Barcelona came out firing early on. Messi’s love affair with the post continued after Coutinho fed him with a delicious lob pass. The 5-time Golden Boot winner had hit the framework of goal, an incredible 13 times last season. Despite this, he managed to score 34 league goals last season, the highest in Europe. Barcelona’s expensive prodigy, Dembele wouldn’t make the same mistake, scoring the goal that restored Barça’s two-goal cushion. Valverde released a sigh of relief ash he chose to start the Frenchman for a third game running, keeping the likes of Malcom and Munir on the bench. The precocious 21-year old was having a rather disappointing game before the goal, losing the ball more than any player on the pitch. Suarez registered his second assist of the season, and led the assist charts after 3 games joint with 4 other players. 4 minutes later, Leo Messi returned the favour to Rakitic, who had assisted the equaliser. Barça’s captain played in a lobbed through ball to the Croatian who hit the ball on the half volley into the bottom right corner. Never a strange sight seeing Gerard Pique in the search for goals as the Center-Back headed wide after Dembele played in a cross to an overcrowded box. It was raining goals in the Catalan capital. In the 61st minute, Coutinho put through a slick through ball from his own half which beat 3 defenders, and let Leo Messi open on goal. Leo doesn’t miss those, and appreciated the Brazilian’s pass by pointing at him, immediately after scoring. With 25 minutes still left to play, Valverde decided it was time to give the new acquisition, Clement Lenglet his debut. He came on for fellow French defender, Samuel Umtiti. Arturo Vidal and Arthur came on as well for Rakitic And Busquets to freshen up proceedings. Huesca too, used up all three of their substitutions. The Liverpool men, Suarez and Coutinho played out a brilliant attack which was stopped in its tracks by goalkeeper Axel. Barcelona’s record signing seemed rather disappointed after not scoring a one vs one. Before this game, he had scored in 3 consecutive home games for Barcelona. The ‘Messi-Alba’ connection was not missing as the two helped to register Barcelona’s staggering 7th goal of the game. Alba went through on goal courtesy of an ever so smooth Messi through ball which had the entire defence in shreds. It could have been a wonder goal after Vidal’s overhead effort played right on the head of Luis Suarez who could not do any better than head it wide. A lot of eyebrows were raised at the striker’s dip in form and his a gradual fall from grace as one of the planet’s most feared frontmen. This game showed otherwise, as the Uruguayan showed a touch of class – playing brilliant passes, completing dribbles, and winning 75% of all his duels. The former Ajax forward also won a penalty later during stoppage time. 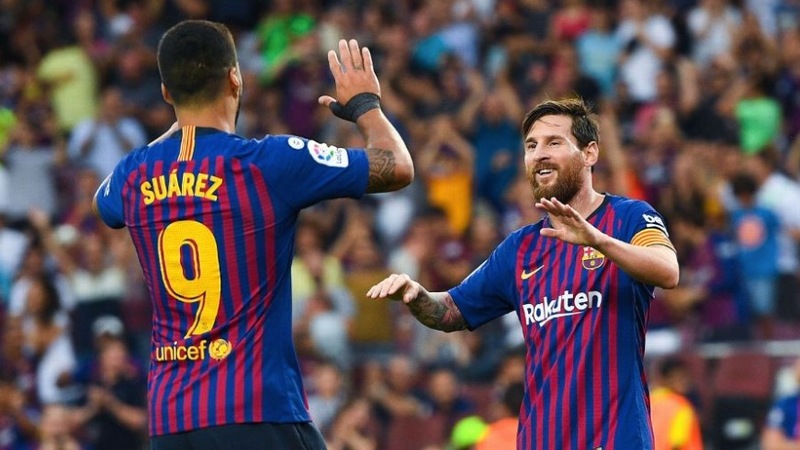 The Messi-Suarez bromance continued as the Argentine, who was on a hattrick gave the penalty selflessly for Suarez to dispatch. Full credit must be afforded to Huesca for coming to the Camp Nou and playing attacking football right from the beginning, something not many so-called smaller teams are sport enough to do. Barcelona’s No. 10 was at his brilliant best, scoring two, assisting two, winning all his dribbles, playing in a massive 9 key passes and winning 71% of all his duels. Messi was simply unstoppable and too good for Huesca. This game showed that any defence in the world would have a tough time trying to stop an on song Barcelona. Barcelona maintain their 100% record of the season, and stand tall at the top of the league with a +10 goal difference.